The 3rd East Zone Hindalco Cricket Tournament under Aditya Birla Group was organized 1st time by Utkal Alumina International Limited(UAIL) at Doraguda, Tikiri, Kashipur this year. Ten teams of Hindalco group of industries from Chhattisgarh, Jharkhand, West Bengal and Odisha including two teams from host Unit, UAIL participated. 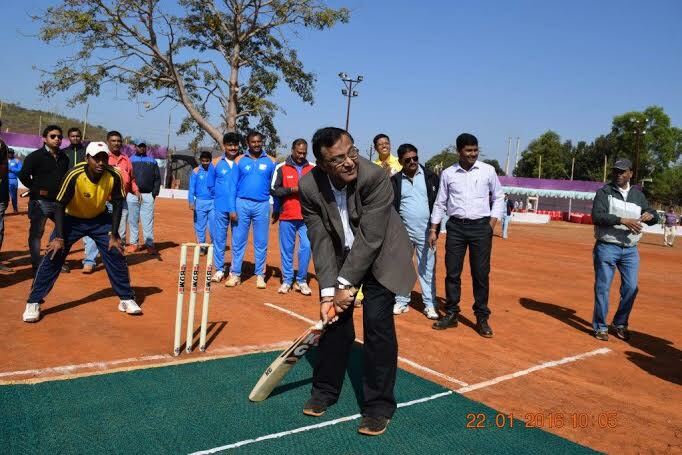 The tournament was inaugurated at Utkal’s Nuapada Township Ground for 3 days upto 24th January,2016. It will be played day and night. The finals will be held on 24th January,2016. The inauguration and oath taking ceremony of the players was held at 09-00 AM at the Cricket ground of Utkal Alumina . Mr. Vijay Sapra, Unit Head & President, UAIL inaugurated the grand event. The tournament was coordinated by Mr. Ragunatha Pratihari, VP(HR) of Utkal Alumina. All the employees including those of ABPS and Partner Agencies and their family members and local community members witnessed the inauguration programme and the match in large numbers to encourage the participating teams. Mr. Rakesha Misra, GM-Admin, Mr. Nityanada Das, DGM(HR), Mr. A Satyanarayan, AGM Mines, Mr. Siba Mahapatra, AGM-CSR and Brajbidhu Chhatoi, JagdishPadhi, Bapuna Panigrhi, Joyti Pradhan, Bhojaraj Das, Belkar Naik, PrafullaNaik, Subash Naik, Srinibas Behera, Gajendra Naik, Satyabana Pradhan were the organizing team members. The tournament was conducted by a team of empires of Odisha Cricket Association namely Mr. Sanjay Nayak, Mr. MD Ishaq, Mr. Aswini Samal. Mr. Nilamadhab Biswal. Live commentator in Hindi , Odia & English were Mr, Bhojaraj Das, Tejbali Yadav ,Gobinda Naik & Tarini Sahu. 2nd match was played between Utkal Alumina Vrs Lohardaga Mines of Jharkhand. Mr.Chandrmohan Kumbhar of Utkal Alumina made 92 runs with 10 “6” and 6 ’4’, Prasad -23 Utkal Total Run 197 in reply Lohardaga made only 125 run with all out.